While many investors refuse to accept this fact, we are clearly marching toward higher treasury yields later in the year and in 2015. Even after today's bond selloff, we are still around the yield levels we had during the dark days of the government shutdown. Here are a couple of key factors that will drive yields higher from here. 1. Many are pointing to record low yields in Europe (see chart), suggesting that on a relative basis treasuries look attractive. Perhaps. But it's important to make that comparison based on real rates rather than nominal. And given the disinflationary environment in the Eurozone (see chart), a significant rate differential between the US and the Eurozone is justified. After all, we've had a tremendous differential in nominal yields between the US and Japan for years. 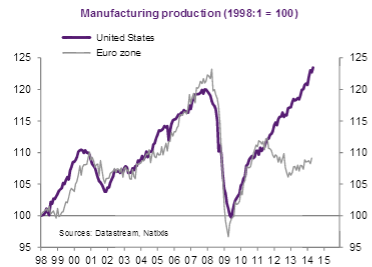 Furthermore, economic growth (and expectations for growth) in the euro area and in the US have diverged significantly (see chart). Today's US GDP report confirmed that trend. 2. The net supply of treasuries is not static. In particular when it comes to treasury notes and bonds (excluding bills), the Fed has been the dominant buyer (see chart). With the Fed tapering, the net supply is expected to rise. Foreign buying of notes and bonds has declined and is not expected to replace the Fed's taper. It will be primarily driven by China's rising foreign reserves. But given declining support from the Fed, China is likely to make bills (vs. notes and bonds) a larger portion of its purchases. And bill purchases will have a limited impact on longer dated treasury yields. To be sure, we are going to have plenty of demand for treasuries going forward. But given such a spike in supply and improved growth expectations, something on the order of 50-75 basis points increase in the 10-year yield in the near-term is not unreasonable. It is also worth pointing out that with the dealers remaining cautious holding significant inventory and the Fed out of the picture, higher volatility in treasuries becomes more likely.